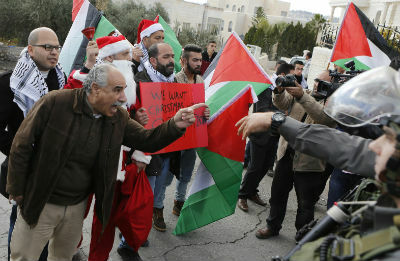 JERUSALEM (CNS) — Jesus’ message of love and peace resonates among Palestinians seeking justice, said Palestinian President Mahmoud Abbas in his Christmas message. Abbas also noted that the prayers for the people in the Gaza Strip and for Palestinian efforts to achieve unity between Hamas and his own Fatah party have not yet succeeded. The prayers also extend to designate Jerusalem as the capital for Palestinians, he said. Jerusalem is contested as the national capital of both Israel and an eventual independent Palestine. He emphasized the Christian and Muslim character of Jerusalem and chastised the Israeli government’s attempt to make it an exclusively Jewish place. “The mosques and the churches of Jerusalem will continue to remind the world of the Palestinian, Arab, and Christian and Muslim identity of the city. Justice means ending the Israeli occupation of East Jerusalem, an integral part of the state of Palestine on the basis of the 1967 border,” Abbas said. He also expressed concern for Palestinian Christian families and Catholic institutions of Beit Jalla, whose land in the Cremisan Valley near Bethlehem is being threatened with confiscation by Israel for construction of a security separation barrier. “On that note we salute the role of the local churches and their institutions in defending their land and Palestinian national rights and advocacy all over the world,” he said. In Gaza, the Christian community had been looking forward to receiving the travel permits that would allow them to travel to celebrate the holiday in the West Bank, and which also would provide some relief from being enclosed within Gaza’s borders. But Israel’s travel restrictions prevented Palestinians between ages 16-35 from receiving permits, leaving many families separated during the holidays. 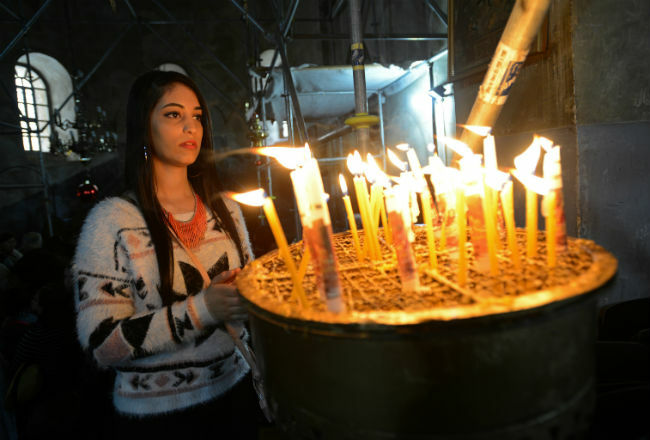 In a change from previous years, Christmas celebrations were more publicly accepted, Sami El-Yousef, Catholic Near East Welfare Association regional director, explained after a three-day visit prior to the holiday. Santa Claus figures were being sold in the streets, and some hotels were decorated with Christmas trees and tinsel, he said. Many people, including Muslims, came to photograph themselves with a Christmas tree, he added. During the conflict in July and August, Greek Orthodox and Catholic churches provided shelter for many families whose homes had been destroyed by Israeli attacks. Christian medical institutions, including the Middle East Council of Churches clinic, provided much needed care to injured people. The situation in Gaza remains dire, despite the church’s efforts, El-Yousef said. CNEWA was able to repair 90 homes of Christian families which had been damaged in the war, bringing some relief during the holiday.